age into the storage register. The instruction is passed from the storage register to the instruction register. Then the operation part of the instruction is decoded so that the proper arithmetic or logical operation can be performed. The address of the op­erand is sent from the instruction register to the address register. At last the instruction counter register provides the address register with the address of the next instruction to be executed. Data enter the ALU and return to main storage through the storage register. The accumulator serving as a register holds the results of processing operations. 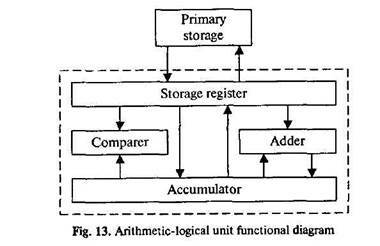 The results of arithmetic operations are returned to the accumulator for transfer to main storage through the storage register. The comparer performs log­ical comparisons of the contents of the storage register and the accumulator. Typically, the comparer tests for conditions such as "less than", "equal to", or "greater than".